Decanter Centrifuge can be widely used for Dewatering, Solid & Liquid Separtion, Liquid Clarifying in the field of Liquid Treatment, Waste Water & Sewage Treatment, Animal Waste, Ore Slurry, Pulp, Chemical, etc. There it is such A HUGE MARKET here! Clients & End Users prefer to purchase alternative models, in order to save cost and delivery time, as there are many Companies that are well known in the filed of Decanter Centrifuge manufacturing. 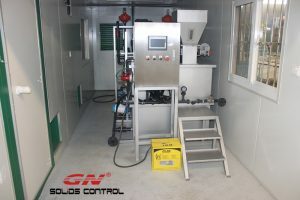 GN Solids Control focus on manufacturing & supplying Decanter Centrifuge for 11 years, and supplies about 200 sets for International market every year, with 70% supplying for International Market, including USA, Canada, Netherlands, UK, Australia, UAE, China, etc. GN has two factories under operation, and a third one under manufacturing now, with more than 100, 000 square meters totally. GN can supply from 9 inch (220mm) to 30 inch (760mm), with bowl length and diameter ration up to 4.2, and adjust G force is up to 3000G, to meet different requirements. GN can send engineer for helping the first time commissioning of the products if by clients request. GN guarantees the goods for 14 Months after shipment or 12 months after commissioning whichever comes first, during the guarantee period. GN would be responsible for problems caused by quality of production or raw material. Welcome to contact us for more Technical Specifications and Working Video of GN Decanter Centrifuge. Since early this year in CIPPE Beijing, GN Solids Control firstly showed its big bowl decanter centrifuge GNLW764-VFD, the super bowl decanter centrifuge with a diameter of up to 30 inches, this centrifuge model got lots of attentions from the end users, especially from the construction work and piling projects. The large capacity and excellent performance is exactly what they want. 1. With a bowl of 7650mm long, while 3344mm as a bowl diameter, GNLW764 is promised to have a large treating capacity in order to be suitable for many applications. 2. Because for the large length diameter ratio, which is up to 4.4 and also a G force at 3000G by high speed rotating, this centrifuge could give a for a perfect separation result, a clearer Liquid phase after treatment. 3. Just as all centrifuge models GN provides, the liquid discharge port is easy to adjust. It helps operator to get a suitable dryness fraction by adjusting rotation speed, differential speed and liquid discharge ports. 4. Stable performance：all rotating part of the centrifuge are fabricated by five-axis machine, and well dynamic balancing tested at high speed to ensure a precise fabrication. Besides, theis model is also functioned with automatic lubrication. 5. Heavy load：GN employs a gearbox with 25000N.M torque for GNLW764-VFD for handling heavy load conditions. 6. Long service life：bowl material is duplex stainless steel SS2304 by centrifugal casting, YG8 hard tiles for impeller protection, and also YG8 material for liquid discharge ports and solids discharge ports. Genuine SKF bearings are used in order to ensure a longer service life. 7. Easy operation：with PLC smart control system，HMI visual operating screen, the operator can observe the on time working condition of the centrifuge. By adding more devices onto the centrifuge like temperature protection for bearings, vibration protection, overload protection and current monitor are all equipped fo this centrifuge, for a more convenient operation. Centrifuges are equipment with high efficiency and various applications. Centrifuges with different sizes are used for different applications. 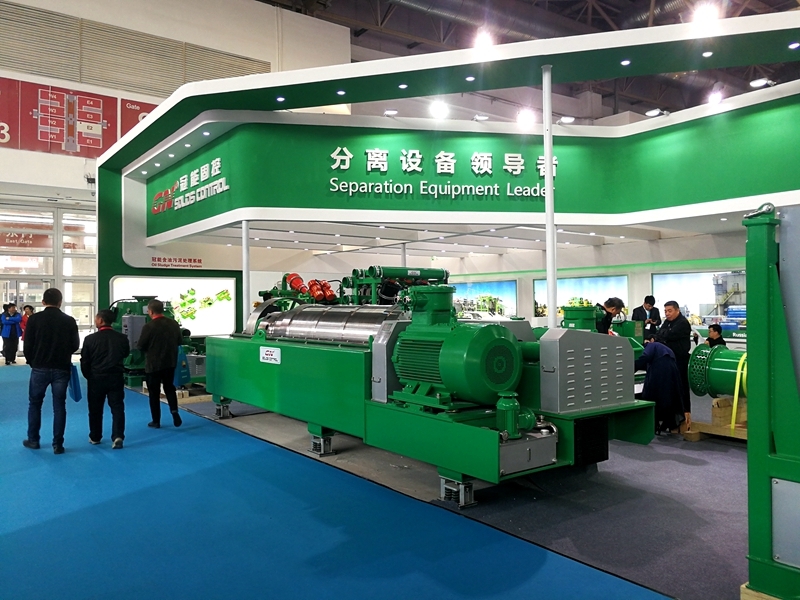 Like among the GN Solids Control’s centrifuge models, the fixed speed 14 inch diameter bowl GNLW363 series centrifuges and GNLW452 decanter centrifuge with 18 inch diameter bowl are widely used for the oil and gas drilling solids control systems for the barite recovery. 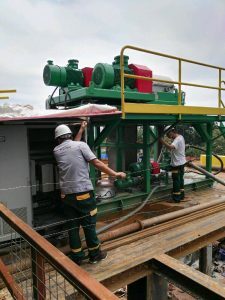 The VFD controlled GNLW363G, GNLW453 and GNLW553 series decanter centrifuges are used for the drilling cuttings waste management when working with a GN high G drying shaker or a GN Vertical cuttings dryer which are respectively for WBM and OBM and drilling fluids treatment projects, when working together with a chemical dosing system. GNLW223 and GNLW224 decanter centrifuges are mostly used for the diamond drilling projects and some projects with small treating capacities. 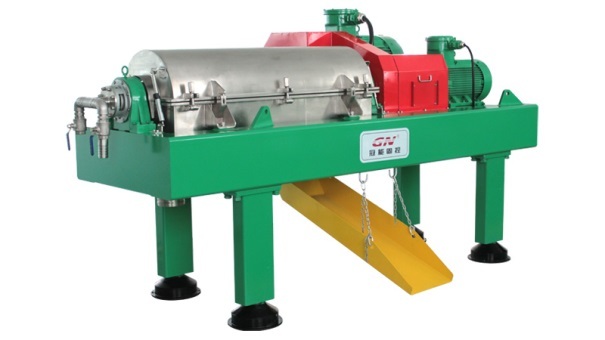 GNLW764 decanter centrifuge is a newly designed decanter centrifuge with a 30 inch big bowl, and a length bowl ratio as large as 4. It is specially designed for the big TBM projects, working after the shale shaker and desander plant. 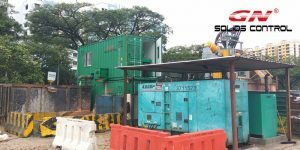 In some clients’ jobsite, there are 2 parallel desander units, each including one GNZS594 shale shaker and a GNZS594-2S12N mud cleaner. All fluids after treated by the 2 desander unit are transferred to the giant decanter centrifuge. On inlet of decanter centrifuge, there is a set of GNDW2000 Dewatering unit, it is used for chemical dosing for the centrifuge. It has 3 chambers for adding different chemicals for flocculating the extra fine particles into bigger ones, in order to be separated out by the centrifuge. 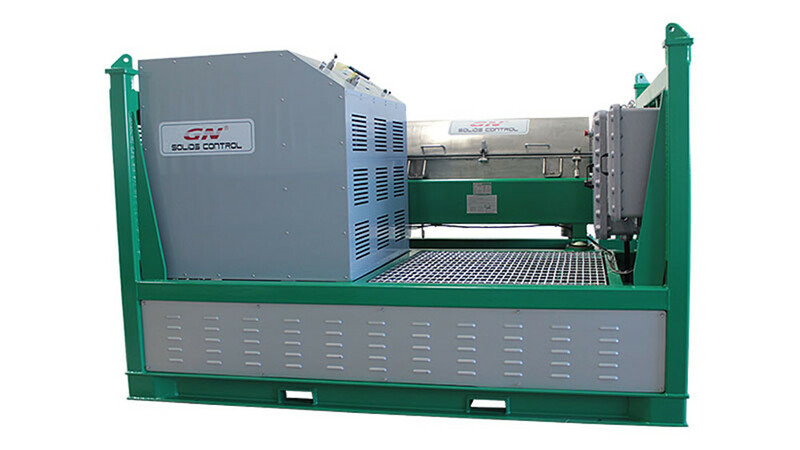 Although after flocculation, the decanter centrifuge’s treating capacity is greatly reduced, GNLW764 could still handle a large capacity upto 90 cbm per hour. Except for the giant centrifuge, other sections of the system are all designed into 20 ft containers. Even the shaker and mud cleaner are in frames with container corners. It is easy for transportation and layout. If you need more information, welcome to contact GN Sales team directly.